One of the highlights of my holidays was when my friend Pam from New York visited chez moi for the first time. We seem to only meet in glamorous locations around the world – think luxurious yachts in St Barth’s, exclusive resorts in Mexico, dinners in fine restaurants in Manhattan (and when I can be persuaded across the East River in Brooklyn) and Long Island mansions in the summer. Like two ladies from a Henry James novel we weave in and out of each others lives with barely enough time to catch up on the cement of life that happens in between these building blocks of time. Our paths don’t cross nearly enough – but when they do I know I’m in for a treat. Pam is a great conversationalist. She’s also a whizz at getting to the heart of a problem and laying out a path of action. In her real life (rather than during our brief respites in paradise together) Pam is a therapist. I have such fond memories of having to force ourselves to go to sleep as we talked and talked into the early hours. The waves lapping at the side of the boat the only accompaniment to our shared secrets. 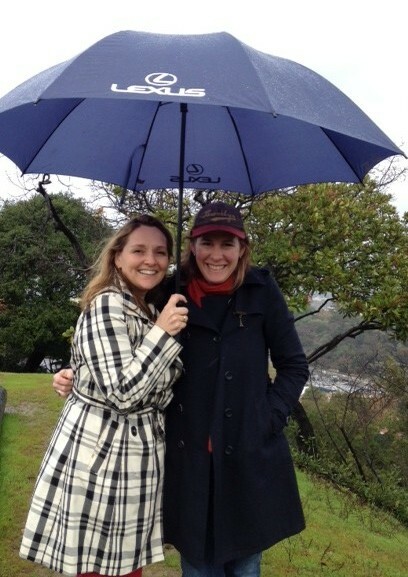 Pam visited on a soggy day in late December – somewhere in the fog behind us is the Hollywood sign for that touch of glamour never far away from our meetings. So what did I make for Pam when she came to breakfast with her husband Charles and her children Louise and Nathan. I made up a batch of sticky buns – using Aida’s recipe from Keys to the Kitchen. But here’s the problem – Pam is gluten free and couldn’t tuck in to the rich buttery brioche buns that have become my go to recipe. 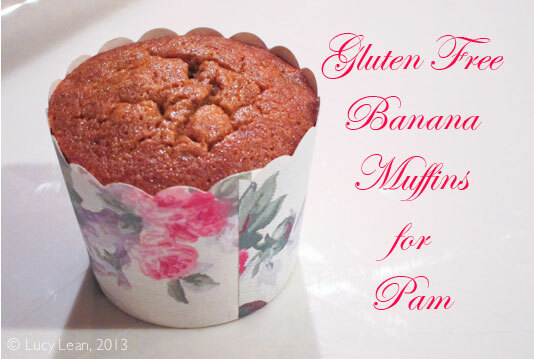 Instead I baked her a batch of banana muffins – gluten free of course, in the prettiest little cases I’ve ever seen. Now I’m not a whizz with the gluten free thing – I tend to dabble – very lightly – with the odd recipe that happens to be naturally gluten free – my chocolate buche de noel being one – and the base for all birthday cakes. The gluten free version that I tried of the quick cinnamon buns weren’t great and even the kids turned up their noses at them. So I crossed fingers and toes that my usual banana bread recipe would translate to Gluten Free if I substituted gluten free flour and some almond meal. 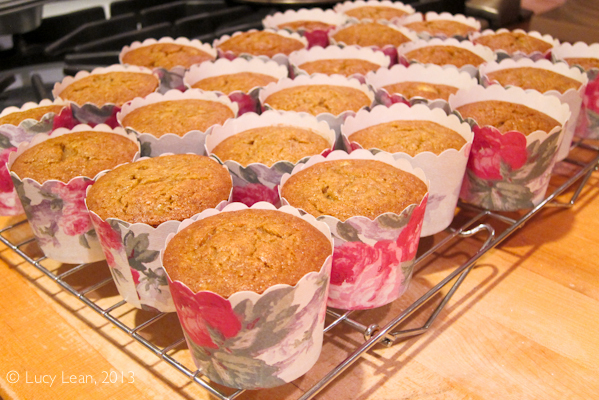 Luckily these muffins rose, have a light moist consistency and most of all taste delicious. 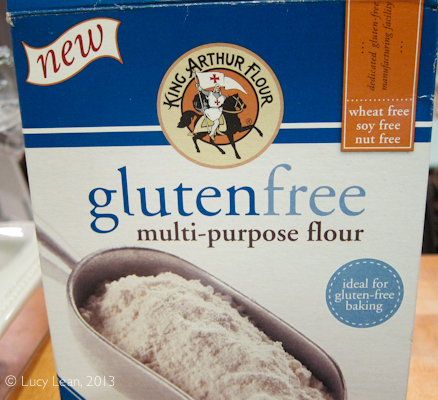 So delicious in fact that you wouldn’t know they are gluten free! Pam departed with a bag of her special muffins – gluten free baked goods, especially for breakfast, being hard to find. 2. Prepare 24 muffin cases. 3. In the Kitchenaid with the paddle attachment lightly beat the eggs. Add the bananas, sugar, pumpkin purée and vanilla extract and mix until well combined. 4. In a large bowl sift together the flour, baking soda, salt, nutmeg and all-spice and then stir in the almond meal. Slowly fold these dry ingredients in to the wet ingredients. 5. Finally pour the melted butter in to the batter and mix until just combined. 6. 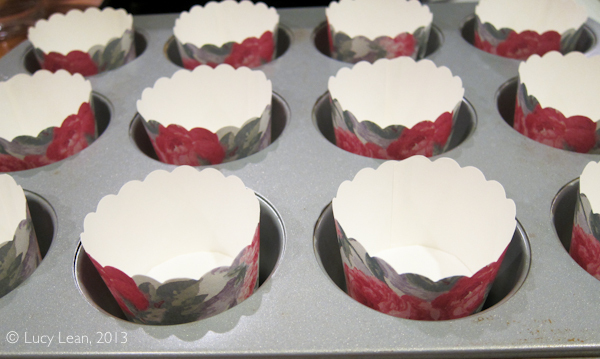 Divide the batter between the 24 cases (about 2/3 full) and bake in the middle of the oven for 25 – 30 minutes or until the muffins have risen, are golden brown and a skewer inserted into the centre of a muffin comes out clean. I can usually tell if the muffins are ready by lightly touching the top – it should spring back. Those little muffin wraps are adorable! The muffins look so tasty! Mmm. Sounds like a super fun visit with your pal Pam 🙂 Nice muffins too! I’ve made these delicious muffins twice since returning to NYC.! My non-gluten free family keeps clammorning for them!